History is a movement and not a condition, a voyage and not a harbor! The city of Mumbai never ceases to surprise one with the amount of uniqueness it hides within its bosom. The many museums that dot the city have in store a wonderful collection of relics from the past. The huge single stone Elephant statue that greeted the first Portuguese settlers on the Elephanta Caves now stands proudly in the Jijamata Udyan (Victoria garden) outside the oldest museum of Mumbai, Dr Bhau Daji Lad Museum, formerly known as the Victoria and Albert Museum while the Asiatic Society Library houses one of the only two first edition original copies of Dante’ Divine Comedy. Along with similar such wonders from the ancient past, Mumbai is also home to marvels from the recent past as well and one such spectacle is the marine museum, INS Vikrant, the only WW-II era aircraft carrier preserved as a museum. It was in 1957 that India had its first aircraft carrier naval ship when it purchased the HMS Hercules from the United Kingdom. This formidable Majestic class ship was rechristened as INS Vikrant and commissioned into the Indian Navy in 1961. The aircraft carrier saw active action during the Indo-Pak war of 1971 and was primarily deployed for a naval blockade of erstwhile East Pakistan. The Sea Hawk aircrafts that were stationed on INS Vikrant devastated enemy ships and played an important part in the ending of the 13 day war which resulted in the creation of an independent country, Bangladesh, on the eastern borders of India. 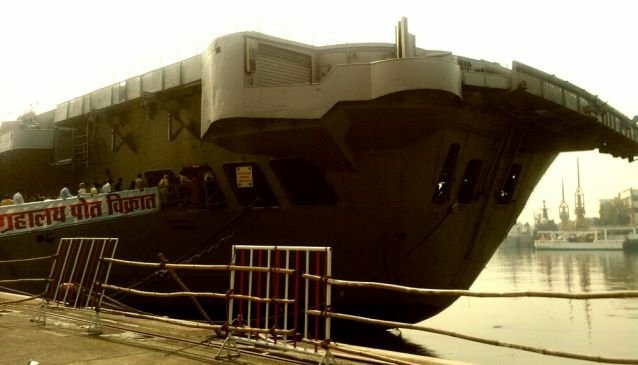 INS Vikrant continued to be India’s sole aircraft carrier for more than two decades but gradually time caught up with it and inspite of many refitting and renovations; the grand dame of the Indian Navy was formally decommissioned in January 1997. The retired naval ship was first speculated to be a hotel, a training ship and a permanent floating museum, (though not in that order) but gradually with the other options fizzing out, INS Vikrant became the Indian Museum Ship (IMS Vikrant). Docked near the Gateway of India and approachable by ferries, the entry to this museum is restricted as it is still under the Indian Navy. It is usually open for the general public only during the Navy Week celebrations in December, every year. The museum has a fascinating collection of things that try to re-enact the glorious days, when the air craft carrier was seaworthy and includes decommissioned and model aircrafts, submarines, naval armaments and naval uniforms among other artifacts. These help a long way for the visitors to appreciate the pioneering role INS Vikrant played in the naval aviation of the country. The operations of the Indian Navy are brought to the fore through displays on board INS Vikrant that depict various naval activities like rescue missions, deep sea diving and launch of missiles from sea. The Indo-Pak war of 1971 was a golden period for INS Vikrant and to highlight the very fact, a complete section is dedicated to the Naval escapades of the premier Indian air craft carrier during the war. But unfortunately lack of funds has dogged the Indian Museum Ship since the very beginning and the government has over the years not been able to find a corporate to partner and operate the museum on a long term permanent basis. If latest reports are to be believed, then the days of the majestic aircraft carrier are numbered. The government it seems is planning to scrap the museum itself. If it does so, then it would be a loss that would be colossal in terms of the glorious piece of history that would be lost along with it. INS Vikrant had been a fighter all through its sea-faring days, let us hope it lives on to fight another day and continues to be an inspiration for generations to come.